Houle > News > Houle Is Now A Platinum Member in the Canada Best Managed Companies Regional Program! Houle Is Now A Platinum Member in the Canada Best Managed Companies Regional Program! 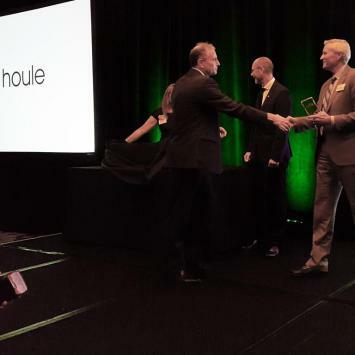 11/22/2018 We would like to thank Deloitte and the other firms involved in the Canada Best Managed Companies program for recognizing Houle as a new regional Platinum member at the Regional Finalist Celebration that was held on November 22nd at the Fairmont Pacific Rim in Vancouver. Rois Rizzo, Houle VP of Finance, was present for the event and did the honours in receiving the award on stage on behalf of all of Houle. Great job and congratulations to everybody at Houle for your skills, dedication, and hard work that have made it possible to receive this prestigious recognition. We would also like to congratulate the other members of the program who received the award, either for the very first time, through requalifying, or by becoming Gold and Platinum members. We extend a special congratulations to some of our close partners in the construction industry that were also announced as winners – E.B. Horsman & Son, EllisDon, Graham Construction, Island West Coast Developments, Maple Reinders, Omicron Canada and PCL Construction.